Twenty-two high school wrestling teams from Maryland and Virginia competed January 8-9 at the 23rd Patriot Classic Wrestling Tournament at Northern High School in Calvert County. This was an individual competition tournament rather than a multi-dual meet, but team scores were compiled based on points scored by the teams’ individual wrestlers. 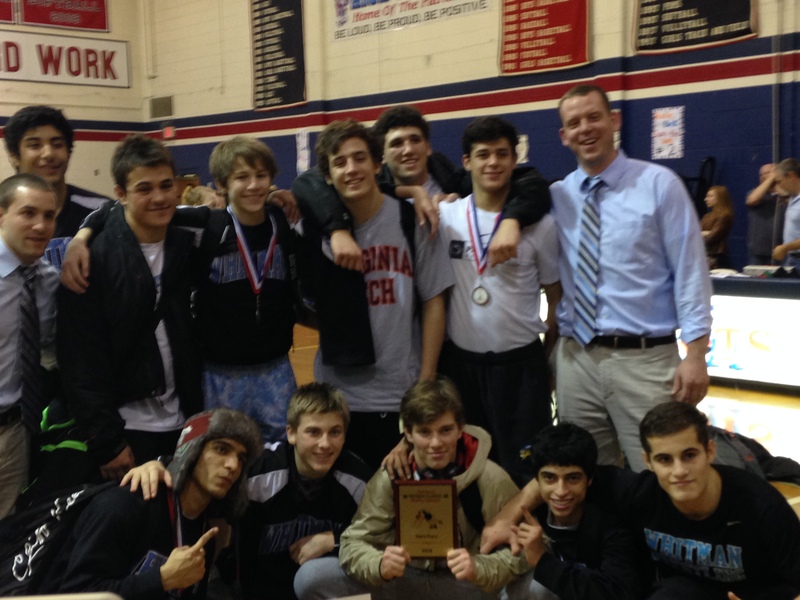 Whitman wrestlers competed in 11 of the 14 weight classes and the team finished third in the tournament, behind Oakdale (Frederick County) and Old Mill (Anne Arundel County) high schools. Eight Whitman wrestlers placed in the top five in their weight categories, and no Whitman wrestler had a losing record in the tournament. Undefeated senior Mitch Fenton, the top ranked wrestler in the State at 152 pounds, took first place at that weight level, triumphing in the final over his Oakdale opponent, and senior Hamoon Shokoohinia, who came into the 145 pound bracket as the top seed, pinned his Herndon opponent in the second period of the championship match. Full details of the tournament results are published at http://www.thewrestlingtourney.com. Whitman’s next match will be at home January 13 against the 2-4 Sherwood High School Warriors. 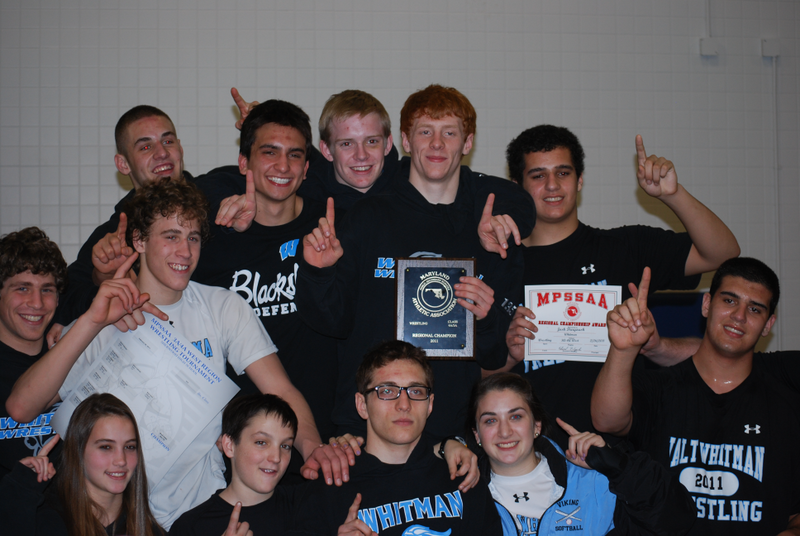 Posted on March 7, 2011 by Dona | Comments Off on Whitman Places 11th at States! Posted on March 7, 2011 by Dona | Comments Off on Whitman Wins 3rd Straight Region Tournament! Whitman Wins 3rd Straight Patriot Classic! Posted on January 12, 2011 by Dona | Comments Off on Whitman Wins 3rd Straight Patriot Classic! 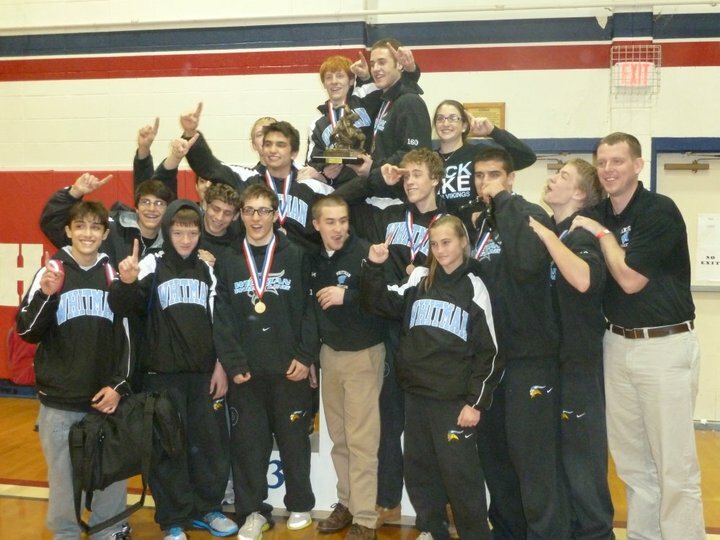 The Whitman wrestling team won their third straight Patriot Classic at Northern High in Owings, MD. Paced by individual champions Mike Harder at 140 lbs. and Eric Harder at 130 lbs. the Vikes were able to comeback and then hold off second place team Hammond. The Viking wrestlers used a multitude of pins to climb back to the lead on Saturday after being down over 30 points in the team race. Whitman had 204.5 total points to 200 by Hammond High School. Other placers include Ned Daryoush (2nd place), Brad Taylor(171 lbs) and Will Bouten(135 lbs) both placed in 3rd place, Josh Daryoush (215 lbs), Andrew Follmann (152 lbs), and Alex Hysong (152 lbs) all placing 4th place in their weight class, and Jacob Rosenblum(112 lbs) placed 6th. Congrats to Jacob Rosenblum for placing in a tournament for the first time in his varsity wrestling career. Jacob was the team’s 103 lb’er last year. Eric Harder won each of his matches by bonus points including a major decision in the final. Will Bouten capped his tournament by pinning the only wrestler who beat him in the 3rd place match. Mike Harder pinned all three of his opponents including a first period pin in the finals. Alex Hysong came back with four wins on Saturday. Alex’s best win was winning a match 9-8 after he was down 7-1 with one minute left. Great job by Alex wrestling for six minutes! Brad Taylor turned in one of the most impressive performances at the tournament winning five matches all by pin!! Brad capped off a great tournament by winning in the third place match with a thrilling 3 second pin!! Josh Daryoush had four wins in the tournament and Ned Daryoush had three pins in the tournament. This was a total team effort. Each of the wrestlers did a great job and wrestled with pride in each of their matches. Comments Off on Whitman Wins 3rd Straight Patriot Classic! Vikes Wrestle to 2nd Place Finish at Mad Mats! 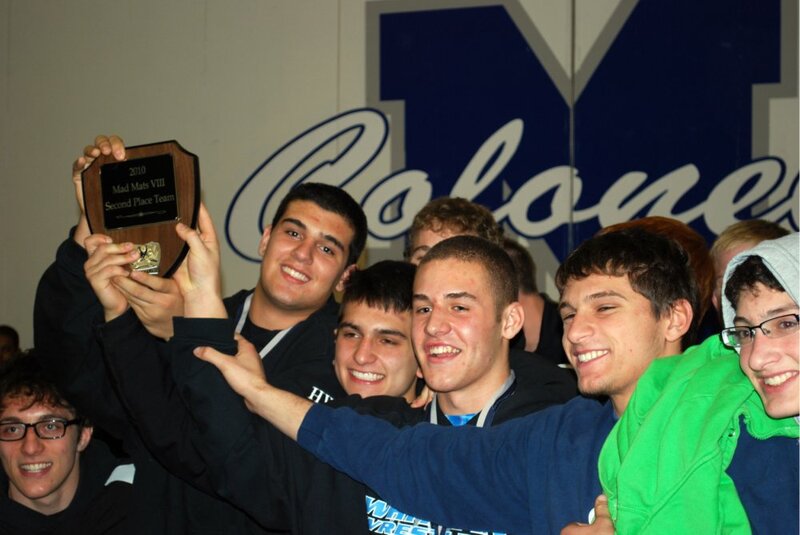 Posted on December 22, 2010 by Dona | Comments Off on Vikes Wrestle to 2nd Place Finish at Mad Mats! The Whitman Vikings wrestled hard and placed 2nd out of a field of 19 teams at this seasons early season Mad Mats tournament held at Magruder High School. The Vikes were paced by Champion Andrew Follmann at 152 lbs., and finalist Alex Hysong at 160 lbs. Additional placers included Harriet Symington (4th at 103), Eric Harder(3rd at 135), Will Bouten(3rd at 140), Mike Harder(4th at 145), Brad Taylor (5th at 171), Josh Daryoush(4th at 215), and Ned Daryoush(3rd at HWT). Comments Off on Vikes Wrestle to 2nd Place Finish at Mad Mats! WHITMAN WRESTLES TO 3RD PLACE FINISH AT STATES! Posted on March 8, 2010 by Dona | Comments Off on WHITMAN WRESTLES TO 3RD PLACE FINISH AT STATES! 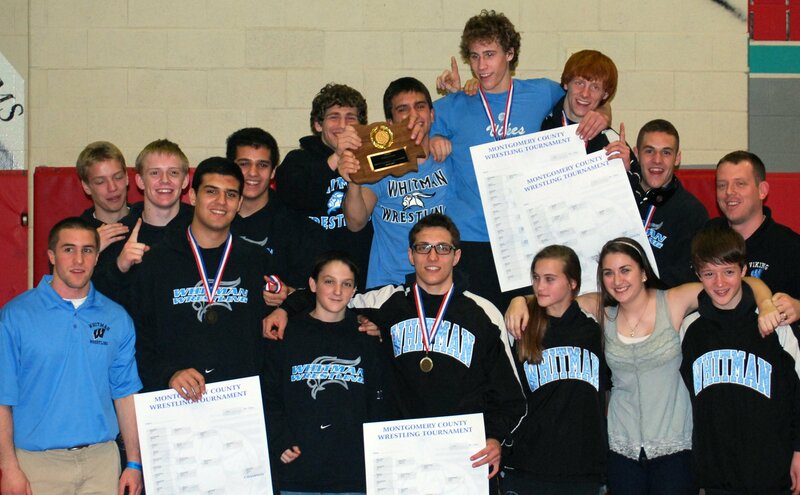 The Whitman wrestling team capped off another amazing season with a third place showing at the 4A/3A State Tournament. 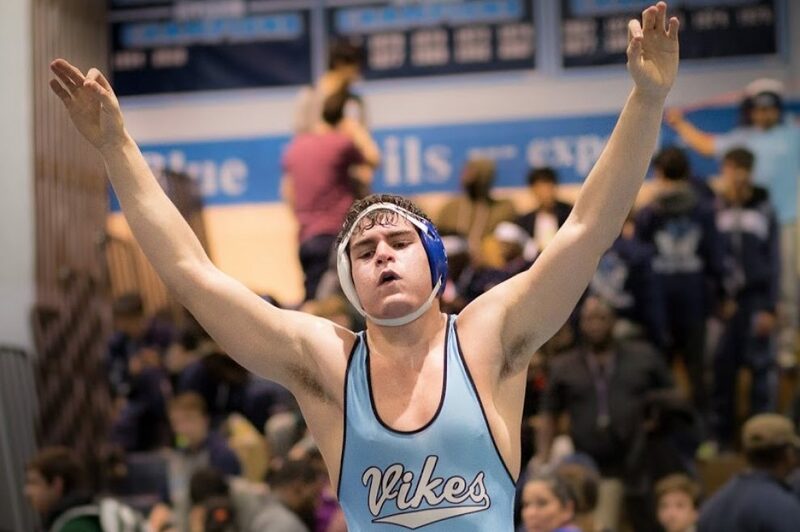 The Vikes qualified an impressive 7 wrestlers for States. Senior 112 pounder Sawyer Symington qualified for States for the second consecutive year. Sawyer went 1-2 in the tournament contributing to the team’s impressive 78 points. Junior 130 pounder Eric Harder won his first two matches on Friday night to put him into the semi-finals and automatically place. There he lost to the eventual State Champ. However, Eric wrestled aggressively Saturday afternoon and won two tough matches to take third. Junior 140 pounder Mike Harder went 2-2 in the tournament. Mike wrestled very well and missed out on placing by one match in the tournament. Junior 145 pounder Andrew Follmann also placed in the tournament. Andrew is also a two-time state qualifier. Andrew lost his first match on Friday and wrestled all the way back to get into the 3rd/4th place match and went 4-2 in the tournament to place 4th in his weight class. Senior 189 pounder Taylor Leighton is a four-time state qualifier!! Taylor is a three-time state placer taking 4th, 2nd, and 2nd. Taylor secured two falls in his first two matches Friday night. Taylor came back on Saturday and won his semifinal to advance to the finals for the second straight year!! Unfortunately, Taylor lost a very close match to a tough opponent 5-3. Taylor finished the year with an incredible 39-2 record!! Senior 215 pounder Danny Lee was the fourth Whitman state placer. Danny is a three-time state qualifier and a three-time state placer. Danny placed 6th, 2nd, and 3rd the past three years. Danny won his first match by fall but then lost a tough match in triple overtime in the quarters. Danny however came back and wrestled with pride to win four straight matches on Saturday to take 3rd place. In his last match he beat the same wrestler who beat him in the quarters by wrestling very aggressive and offensive. Junior heavyweight Ned Daryoush also wrestled very well on both days of the tournament. Ned went 2-2 in the tournament and missed placing by one match. Congrats to the entire Viking squad for another terrific State Tournament and another highly succesful season! Comments Off on WHITMAN WRESTLES TO 3RD PLACE FINISH AT STATES!